The goal of this experiment is to show that ferromagnetic substances become paramagnetic when heated above a certain temperature. It is unlikely that you would perform this experiment live in the lesson. But we want to show it, at least in the form of a video. There are three groups of magnetic materials: diamagnetic, paramagnetic and ferromagnetic. The magnetic properties depend on the structure of atom electron shell and the arrangement of atoms in the structure of the substance. Paramagnetic and ferromagnetic substances are composed of the same kind of atoms but differ in their arrangement. If a ferromagnetic substance is heated and its temperature exceeds a specified temperature Tc (characteristic for this substance), this substance becomes paramagnetic. During cooling, the substance becomes ferromagnetic again when reaching this temperature. The temperature Tc is called the Curie temperature and is different for each ferromagnetic substance. Most of ferromagnetic substances have a relatively high Curie temperature - for nickel the Curie temperature is about 360 °C, iron 770 °C, cobalt 1121 °C. Gadolinium used in this experiment has a Curie temperature of about 20 °C. Gadolinium is a soft, silvery-white metal. Its atomic number is 64 and belongs in lanthanides. It is used in computer hard drives and in nuclear power. In our experiment, we use it in a shape of cylinder. 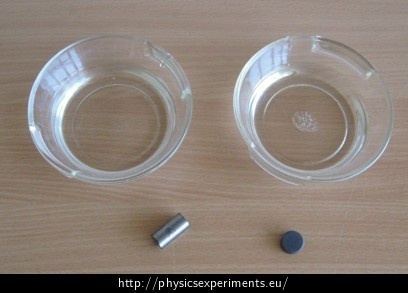 Gadolinium sample, container with hot water, container with cold water and ice, small ferrite magnet. Immerse the gadolinium sample into the cold water and let it cool down. Immerse the gadolinium into the hot water and let it heat up. Then take it out, wipe it and demonstrate that the permanent magnet does not attract the sample. If we cool the sample in the cold water, it again attracts the permanent magnet. The video below illustrates the possible course of the experiment. Idea for this experiment was taken from a Slovenian web page, which is devoted to physics experiments.